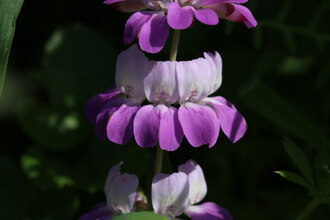 Rose Snapdragon can be an annual or perennial with flowers appearing mostly on one side of the stem. This plant has very sticky sepals & leaves, is hairy and can appear woody. Look for this beauty at the edge of the trail with abundant rose red to magenta flowers accented with a creamy tan and white accent. 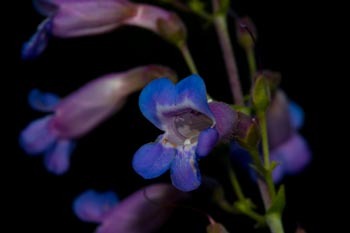 These plants can occur in dense stands of three to five foot tall plants. 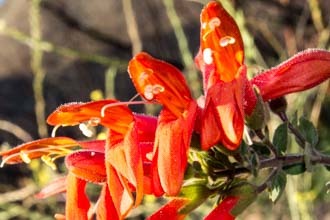 Favoring disturbed areas and often a second year fire-follower, the Rose Snapdragon blooms from May to July (depending on the rains). 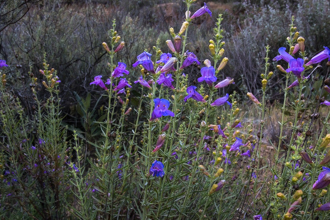 Four different kinds of Snapdragons are found in the Santa Monica Mountains, varying from delicate to somewhat stout herbaceous plants. 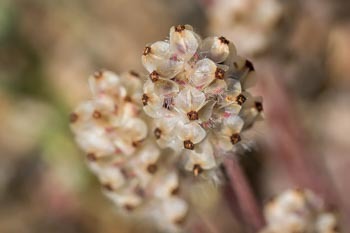 A spike of flowers dominates the upper part of this plant. 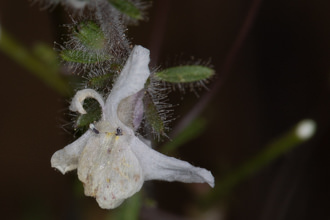 The flower is less than an inch in length, the upper part of the two lipped corolla is quite red while the lower lip is tan or cream in color. The upper lib has two lobes while the lower has three. 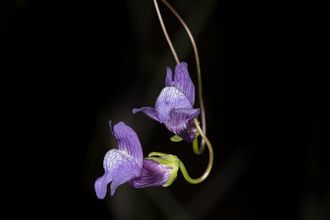 Pistils and stamens are hidden - press the lips together from the side and you should see them. Pollinated by bumblebees that have figured out to work their way in and then back out. Honey bees have not figured this out but occasionally sneak in thru openings on the sides of the flower. 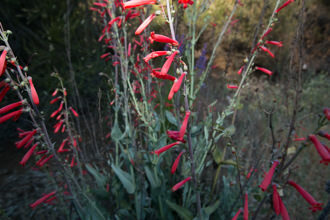 As previously mentioned, Rose Snapdragon favors burned or disturbed areas. The last segment of the Backbone Trail was completed in 2016 by cutting into the dry slope and creating a bench for the trail. Two years later an abundance of Snapdragons were crowding the trails’ edge - taking advantage of the disturbed soil. Seeds had laid dormant in the soil for years, waiting for conditions to be favorable. Antirrhinum translates to “nose like” from the Greek rhinon, a reference to the lower lip; multiflorum comes from the Latin multi, “many”, and floris, “flower”. Last modified: June 21 2018 11:40:13.